It has a lot of little interactive things that my daughter loves. It helps with writing, and the songs are great! You can’t close the app without a home button! The voice of Elmo is distracting and hard to hear. Some kids will only want to play the games. This gave us the perfect opportunity to evaluate the benefits vs annoyances some apps never allow for. We definitely just invested the $5 in the full app. Three letters can become old after awhile. My almost 18-month-old loves the videos. He still needs help drawing and locating the letters, but it's so fun watching his face as he completes a letter! 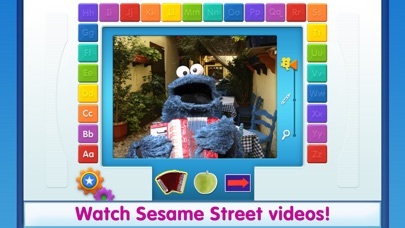 Lots of videos from Sesame Street for letters ABC,but is it really learning? If you wanted to watch Sesame Street videos just use the PBS app. 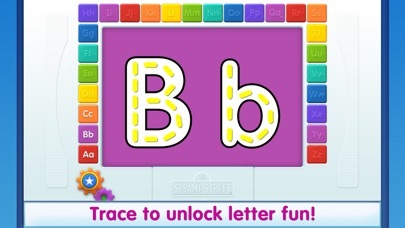 My 2yo really likes this game the problem is you only get the first three letters, if you want the full alphabet you have to buy the full version for $4.99. This app is trying to charge me 10 dollars after I download. Currently speaking with iTunes! Do not download! Lots of learning. I got it before a plane ride and my 2 year old loves it. I was impressed with how much there is to it. I can only imagine what one with the full app. Your child can only access the first three letters of the alphabet to learn, all others are blacked out. Glad I did not spend $5 on the full version first. App will not even open. I'm very disappointed in this "lite" version -- it's really only a trial version with only 3 letters. My 2-year-old was very confused. If you want letters D to Z, you have to buy the full version for $5. My Daughter loves elmo! Thanks sesame street! Please fix all of these bugs. The original version was perfect, now my kid can't use this app without getting frustrated .. There is only so much you can get out of three letters, so that's disappointing. But my 3 yr old loves it and especially the "real" videos! Why does the astronaut make the short o sound for the letter a? Very confusing for a small child! I liked the app, but it took up way too much space. Since my child rarely played with it, I deleted it so I could download more apps. Half the time the app will not open and when it does it freezes up. Very disappointing for a 3 year old who loves Elmo! And this app uses this much memory becaaaauuussee????? Good game but doesn't tell you that you only get A B C for free. My daughter loves it so far and it's very easy to use and has the right interaction. It worked when I first downloaded it. But now it only lets you click on three letters. A, B, and C. Would love it if it could be fixed. It took so loooooooooooong to download this app I just said never mind and stopped the downloading hopefully apple someday start testing the apps before posting them! 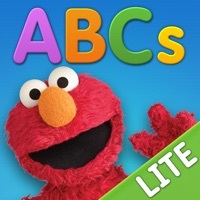 Friendly Elmo leads your child to discovering the alphabet in many different ways. 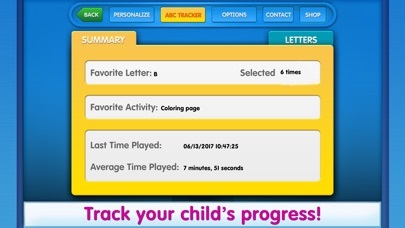 He says the letter, your child traces the letter, and there are 3 different activities associated with each letter. As a mother trying to teach a 2 1/2 yr old boy the alphabet, this app is awesome! My daughter has played this on my parent's iPad. I have tried to install it 3 times on my new iPad and it never works. Nice app for toddlers. My only concern is about ernie and bert's video where ernie put the banana in his ear. Now, every time my 2 yr old son sees a banana, he would put it in his ear. Not a good example for kids to follow :( I'm now deleting this app. My 3 year old loves this app. It is very easy for her to use. 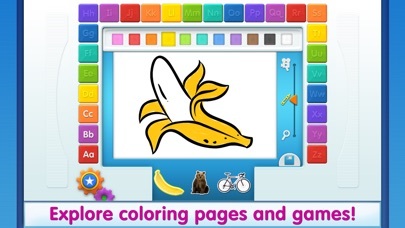 The app is very age appropriate and offers great activities. 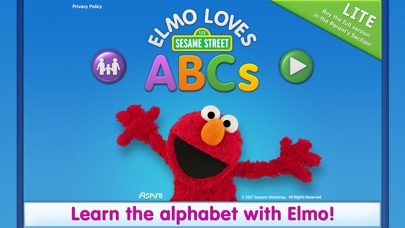 The BIG concern I have about this app is that Elmo is teaching my daughter the WRONG sound the letter "a" makes! My 2 year old loves this and can mostly use it by himself! The hardest part is that he has to trace the lower and uppercase letter if he wants to unlock videos related to the letter! But he recognizes most of his letters and when people asked where he learned them he says Elmo! Fun educational material. The lazy developers get an F for making us download the whole app to see 3/26ths of it. The reviewer that commented he could only get abc letters only is because it's the free version u pay and you'll get all the letters...DUH! I used to only have abc. I got an iTunes card. So I got the full- version. I got to say, my 2 year old loves it! Right now I just downloaded the free version because our daughter is 18 months old and I wanted me and my wife to see if it would work for her now. It looks fantastic. Elmo is surrounded by letters. He asks you to draw the Lower and upper case. When you do videos and more are unlocked. Like a bear video for B. I would think great for whenever your child starts to learn ABCs. Great job Sesame Street. Will buy the full version for sure when our daughter is ready. Hopefully retina update by then. Cannot figure out how to "unlock" all the letters past a,b,c. Elmo says to touch any letter from a to z, but only a,b,c are available. Very frustrating for my 3 year old, and for me. My daughter loved it so I had t buy the full version, which is $4.99. Most expensive app we have purchased. I babysit a 3 year old who (because I read on my iPad) thinks its cool to look at my iPad and poke at it. I started with basic coloring programs or talking programs but she is too little/impatient to deal with most of them. So I started on a hunt to find a toddler friendly app (a free one was preferable). This was perfect. It only plays A B and C, but it's the free version. The full version (which I plan on purchasing as soon as my paycheck comes through) has all the letters. There is so much to do in this game. When I downloaded it I thought it was just going to be a few flash cars with a picture of Elmo on them or something simple. However, I was shocked at how much content there is in this one app! So many videos, pictures, coloring pages, activities and fun (I played it for almost an hour by myself it was actually so cool!). The girl I babysit LOVES it, even this free version. There is so much content that even her attention span was used up with only the 3 letters, and we have repeated them with no sign of her being tired of them. Plus the variation of material gives her a lot to take in while being the usual educational style for sesame street. This version is great to see if your toddler likes the game or if their skill level is appropriate, but also has enough content to see if you like the learning style enough to buy the full version. I love it and plan on getting the full version. This free app is a blessing and I was so glad I found it in my search. You have to buy the full version in order to have all the letters available (as most of the games for iPad). Good overall.